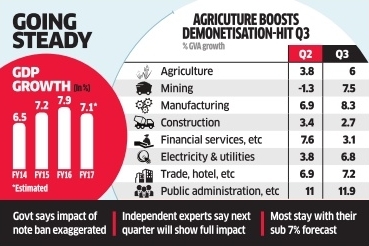 India seems to have braved the effects of demonetisation with the economy growing at an unexpectedly robust 7% in what was deemed to be the worsthit October-December quarter.It's now forecast to achieve 7.1% growth in the year to March. Going by these projections, India will retain its tag of being the fastest-growing major global economy that it was at risk of surrendering to China going by some estimates. 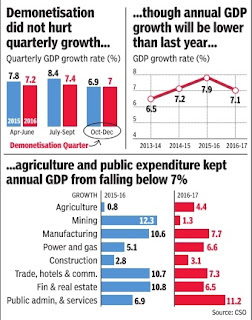 The data is much better than chief economic adviser Arvind Subramanian's estimate in the Economic Survey of 6.5-6.75% growth in FY17 and consensus of growth below 7%. Most experts are still not ready to give demonetisation the benefit of the doubt and are sticking to their estimate of below 7%, reasoning that the real impact will show up in fourth-quarter numbers. India Ratings said much of the demonetisation effect will be visible in the March quarter, leading to overall GDP growth of 6.8% in FY17. Data released by the statistics office in January that didn't factor in demonetisation had also projected growth at 7.1% in FY17, suggesting that the currency swap hadn't had much impact. The numbers show substantial churn at the sectoral level with strong growth in agriculture offsetting slower expansion in services due to the note exchange. Overall December quarter growth would actually have been higher if the same base as in the first estimate had been used. 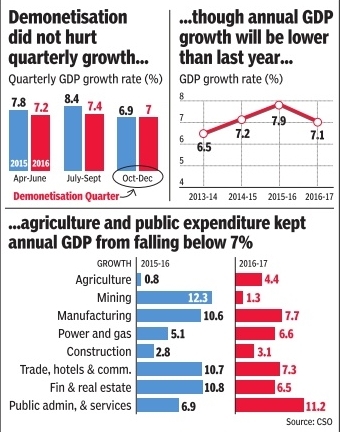 The revised estimates released last month showed that the economy grew 7.9% in FY16 against 7.6% estimated earlier, raising the base for the calculation of numbers for the current year. Overall GVA growth in FY17 is pegged at 6.7%, lower than 7% estimated initially. RBI has projected a GVA growth of 6.9%. Gross fixed capital formation, a measure of investments, has also swung into positive territory with a modest 0.6% growth against the earlier forecast of 0.2% contraction. The data shows a strong 10% growth in private consumption in the third quarter, which goes against the anecdotal evidence of people deferring spending due to lack of cash.